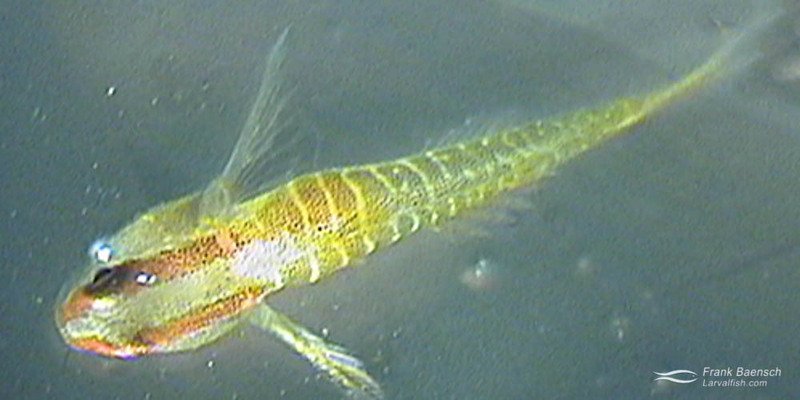 Green-banded goby larvae (Tigrigobius multifasciatus) were raised from captive-spawned eggs at 77-79F on rotifers and artemia. Gobies make up the largest family of marine fishes (possibly over 2,000 species). The smallest fishes (and vertebrates) in the world also belong to this family, such as Trimmatom nanus and Pandaka pygmaea, which are under 1 cm (3⁄8 in) long when fully grown. Gobies are robust in captivity and therefore well suited for the new marine hobbyist. All gobies are demersal spawners. Close to 40 goby species have been captive-bred and 5-10 species are farmed in any give year. Green-banded gobies (Tigrigobius multifasciatus) with nest (in pipe) (top), a 25-day-old green-banded goby post larva (bottom-left), 30-day-old green-banded goby juvenile (bottom right) (video grabs). The Green-banded Goby is a small Caribbean species that only reaches about 1 inch in size. In nature it secretively lives underneath sea urchins just below the tidal zone, using the spiny critters for protection against predators. Its cryptic nature and small size makes it a good addition to mini-reef systems but less desirable for larger tanks. Green-banded gobies accept most aquarium foods but prefer soft and palatable foods such as brine or mysid shrimp and small pieces of gelatin diet. Since this is a more sub-tropical species temperatures should be no warmer than 80º F.
In the wild, green-banded gobies spawn in the wintertime and attach their eggs inside the crevice where they reside with the sea urchin. At my facility the pairs were kept in 10-gallon tanks and spawned in 4-inch long, ¾ inch diameter PVC pipes. Sexing is quite easy since the male has a larger head and a longer first dorsal ray than the female. Males care for the eggs throughout their development, ventilating them periodically. Hatching is induced in early morning or late afternoon of the 7th day when the male goby vigorously thrust at eggs using its tail. Twelve hours later the pair spawn a new nest anywhere from 50 to 200 eggs. The larvae are able to feed on s-type rotifers within 24 hours. Good larval survival can be obtained feeding enriched rotifers and artemia in tetraselmis greenwater. Metamorphosis starts near day 23. This species is only slightly more difficult to raise than clownfishes.